Smart, cool, and forever professional, make a lasting impression with a light blue dress shirt for men. Worn with a suit and tie, your perfectly tailored light blue dress shirt is guaranteed to turn heads at the office. Heading somewhere more relaxed? Slip-off your jacket, unbutton your collar and roll-up your sleeves for an impeccably smart-casual look. A made-to-measure light blue dress shirt is more than a style choice, it’s a statement of quality and commitment to making the best of every opportunity. Looking for that perfect light blue dress shirt? Below you’ll find our recommended designs, all cut and sewn to your personal measurements. Customize any detail at the touch of a button or craft your own light blue dress shirt from scratch with our online design tool. Whatever your preference, your tailored light blue shirt will be a true one-of-a-kind, made only for you. When white feels too predictable, button-up a light blue dress shirt. An essential staple of every man’s wardrobe, your light blue dress shirt will inspire confidence from colleagues, friends and family alike. Wear it with a dark made-to-measure suit, or simply with chinos for a timelessly relaxed look. 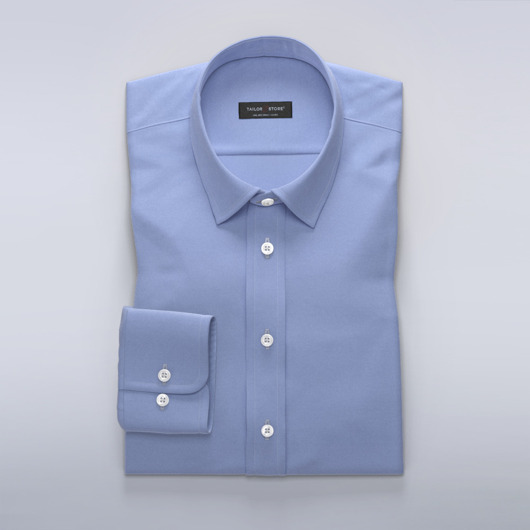 Made from a fine poplin, twill or satin fabric, the light blue business shirt is smooth on the skin with a discrete luster. Wear this shirt with a dark suit at the office, or a pair of jeans and a knitted sweater for a more relaxed look. The light blue casual dress shirt is made of is made of a heavier fabrics like Chambray and fabrics with a visible weave like Oxford, heavier twill or denim. Make your mark with a patterned light blue dress shirt. Stripes and checks are great options, we recommend small patterns on fine fabrics and large patterns on heavier ones.